Asahi Super Dry, the best-selling beer in Japan. It is a brand of nama-biiru(draft beer). Beer was introduced to Japan in the late 1800s when American brewer William Copeland set up Japan’s first brewery in Yokohama. The brewery eventually became Kirin, now a major brewery in Japan, in 1907, with the help of investments from the Mitsubishi zaibatsu and Meidi-Ya. Today, there are four major breweries in Japan, (Kirin, Asahi, Suntory, and Sapporo) which churn out a wide variety of alcoholic beverages. A standard-size can of beer is priced around 200 yen while the ones served at restaurants and izakaya are around 400 yen. In an izakaya, draft beer is usually served in a Jokki, a glass mug with sizes ranging from dai(big), chu(medium), and sho(small). Happoshu is a beer-like beverage that has a malt content of less than 2/3(around 67%), whereas beer has a malt content of over 2/3. Happoshu is cheaper than beer due to Japan’s tax on alcohol; the higher the malt content, the higher the tax is. There is also a factor in the ingredients that are used; malt is considerably more expensive than the corn, soy beans, and starch which are used in happoshu. There is also a beer-like beverage called daisan-no-biiru which is even cheaper than happoshu. Some young people and women actually prefer happoshu for its lighter taste. Many happoshu brands are marketed as a low-calorie, healthy alternative to beer. From left to right: Premium Yebisu , Sapporo Nama Beer Black Label, Kirin Lager Beer, Asahi Super Dry, Suntory The Premium Malt’s. 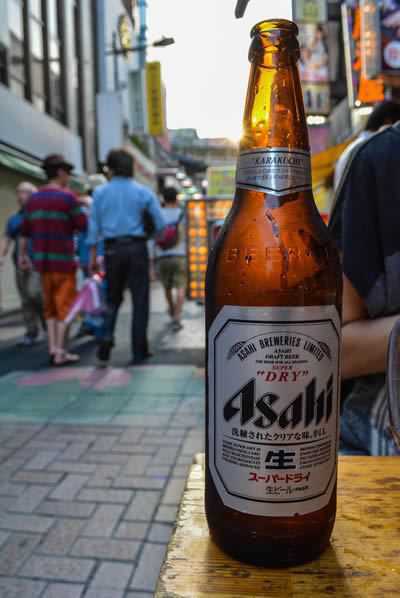 Premium Yebisu – While most Japanese beers may not be preferable to foreigners due to their light, pale taste, Yebisu is quite popular. Yebisu has a 100% malt content and has had a strong following among beer enthusiasts. It is considered an old-fashioned and traditional beer as it is not light like Asahi Super Dry. Sapporo Nama Beer Kuro Label (Black Label) – From the northern lands of Hokkaido, Sapporo is a company that takes pride in selecting only the best ingredients for their product. However, this beer is the least famous beer of the 5 beers. Kirin Lager Beer – This is the only beer that is not a nama(draft) beer of the 5 beers; it’s a lager beer. Although it’s not the company’s best selling product, it is one of their flagship beers. Asahi Super Dry – This beer, introduced in 1987, became Japan’s most popular beer in 1996 after passing Kirin Lager Beer in monthly sales. Asahi Super Dry’s light and sharp taste has become a hit with the Japanese people and still defends its position as Japan’s No.1 beer. 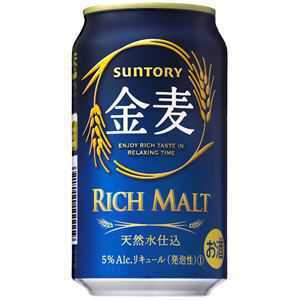 Suntory The Premium Malt’s – Suntory is one of the newer companies and continues to introduce revolutionary tastes to the beer market. The Premium Malt’s pilsner beer has introduced a new genre of premium, high-end beers into the beer market. If you’re just looking to just get drunk, I would recommend happoshu. The best happoshu, I would say is Kinmugi(金麦). OMG Daisan-no-biiru… and I thought happoshu couldn’t go any lower. I can’t drink this stuff it makes me sick!